E3 2018 had no shortage of new zombie games on offer, but easily the biggest and most ambitious of the bunch was Dying Light 2. Following the game’s reveal during Microsoft’s packed Xbox E3 2018 Briefing, developer Techland invited media outlets, including Wccftech, to check out a 25-minute live demo, which definitely left an impression. Most of the basics laid down in the first Dying Light return in the sequel – there’s a day/night cycle, and the game’s zombies (aka “the infected”) are much more active and dangerous at night. During the day you search for loot and crafting items, and at night you use your parkour skills to stay one step ahead of the surprisingly fast, dangerous infected horde. While the underlying mechanics haven’t changed, your post-apocalyptic playground has vastly expanded. 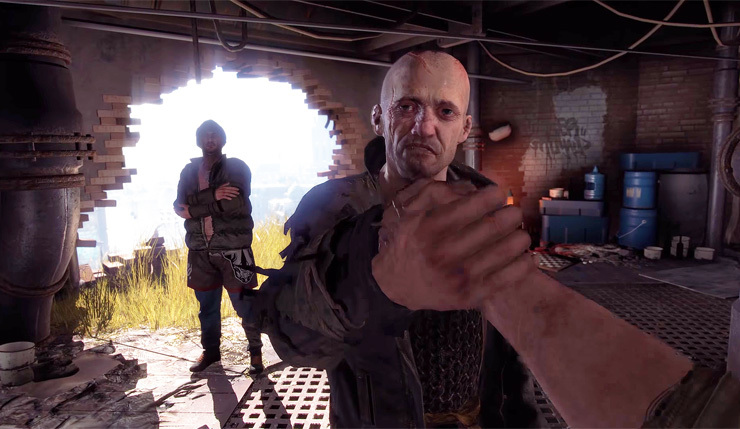 Dying Light 2 takes place 15 years after the events of the first game, in one of the last partially-inhabited cities in Europe. The City (no need for creative names when all the other cities are destroyed) is a dense tangle, with ramshackle structures piled on top of ruined old-world architecture. Vegetation has also begun to reclaim The City, with grass and trees poking out through the wreckage. I was reminded of the Arkham series’ Gotham City, although The City is likely much larger than Batman’s hometown – according to Techland, Dying Light 2’s world is four-times the size of all the original Dying Light’s maps combined. Ultimately though, it’s The City’s human inhabitants that make it unique. Dying Light 2 will present players with a myriad of different factions, which you can opt to help or hinder. In the E3 demo, we got to see one key scenario play out two different ways – a couple of ne’er-do-wells, Jack and Joe, have taken over a key water tower that once belonged to the Peacekeeper faction. After climbing the tower, you can choose to take out Jack and Joe or become an accomplice to their schemes. If you “take care” of Jack and Joe, the Peacekeepers will reclaim the water tower, bringing relative calm to the surrounding region. They’ll chase off bandits, clear out the infected nests, set up handy ziplines, and provide free access to water. Unfortunately, they also have some rather draconian ideas about law and order (hanging seems to be the only punishment they know) and don’t give you any special reward for helping them out. On the other hand, if you side with the criminals, the region will remain a mess, but at least you get a cut of the money made selling water to the huddled masses. The choice between the Peacekeepers and Jack ‘n’ Joe is a fairly easy one – despite their heavy-handedness, the Peacekeepers seem like the obvious choice – but, hopefully, later decisions will be a bit more challenging and/or morally ambiguous. 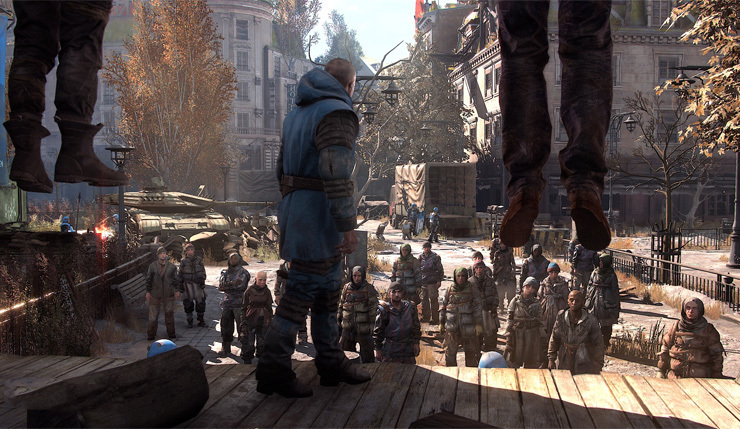 Techland is promising you’ll really be able to make The City your own, but we’ll see if that extends beyond deciding which banners fly over its various regions. In addition to the new focus on factions, Dying Light 2 really leans into its parkour gameplay. You’ll be able to learn twice as many moves as in the previous game, which you’ll need to get through the new “parkour puzzles.” Getting to the top of the water tower means playing through one of these puzzles, which requires all the wall-running, death defying leaps, and precarious, vertigo-inducing balancing you’d expect. As a diehard Mirror’s Edge fan, I have to say I’m particularly excited for these parkour challenges. Based on what I saw in the demo, they’re not breaking any new ground, but they appear to be on about the same level as Mirror’s Edge in terms of level design, which is no small compliment. 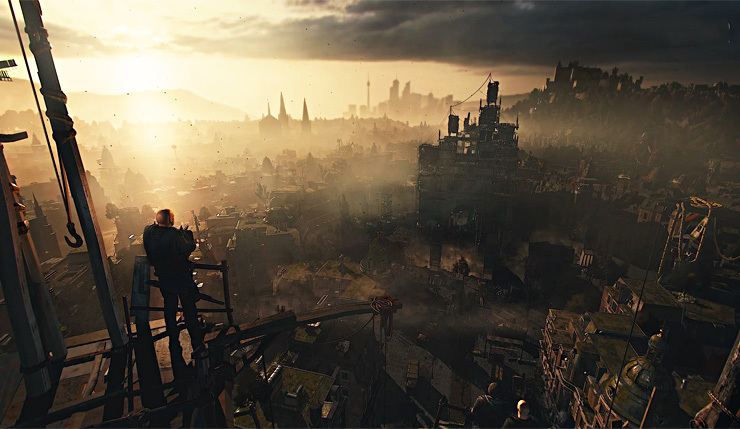 Based on my short eyes-on with Dying Light 2, I wouldn’t say the game is raising the bar in any one area, but its combination of elements – zombie survival, open-world exploration, parkour, faction management – is certainly ambitious. There’s no shortage of open-world games on the horizon, but Dying Light 2 definitely deserves to be on your radar. Dying Light 2’s new virtual society looks like it will have a lot of depth. How many different factions will players end up having to deal with? There are the Peacekeepers, which we showed in the demo, and there’s also another faction, the Scavengers, who are masters of parkour and crafting. They want to create their own version of this world where they just fence themselves off from the infected and live in a safe haven they’ve built. A self-sustained area. But there are more factions after this — we’re not talking about specifics right now, but we’ll reveal more nearer to release. We saw your choices can have a major impact on the human inhabitants of the city, but what about the infected? Can you affect them as well? Of course, yes. There are many examples of this – for instance, if you make the Peacekeepers move to a region, they start clearing out the dark places of infected. So, now they don’t have a place to hide, so they’ll move to a different region of the city. And perhaps there are some other people living there and they will get angry at the Peacekeepers, or even you because you work with them, because you have pushed that threat into their district. During the demo, we saw you could get a cut of Jack and Joe’s profits if you side with them. What can you buy with that money? If you go to the black market, you can get illegal substances, like drugs that give you extra powers. Or you can find weapons that are extremely brutal, that allow you to do really crazy stuff to the infected or humans. You can also find blueprints that let you modify your weapons in very dangerous ways. So, it’s your basic video game economy. Will you maybe have some sort of home base to build up? No, it’s not like that. You travel to the city because you want to find something. You don’t want to build a place for yourself, at least not at the start of the game. But, you will be able to visit, sleep, stay at the hideouts and hubs of factions and other groups you’re allied with. Could you elaborate on the story? You say you have to find something — what might that be? You’re this survivor, who enters the city looking for something…something very important that can change the fate of humanity. Then you have to meet people, you have to talk to people, you have to try to find where that thing you’re looking for is. And that’s the setup basically the whole game. I really enjoyed watching you tackle the “parkour puzzle.” Will there be other parkour challenges as complex as that one? Yes. The one you saw wasn’t that complicated. There will be even bigger, more complex ones. Ones that will require you to do things quicker and without any mistakes. And, of course, as you play the game you’ll learn new moves and you’ll be able to upgrade your stamina, so perhaps you will not even be able to complete [some parkour puzzles] until you progress your character. We look at them almost like a dungeon from The Legend of Zelda, where each one is a specific challenge, and those challenges get more and more difficult with time. Will the infected factor in the parkour puzzles? Will something be trying to bite your leg as you’re attempting to land jumps? Yes. Some of them will require you to go quickly through an area with zombies sleeping, and if you don’t, they’ll wake up. Sometimes, something will happen — for example, a piece of the environment will fall down and they’ll wake up and they’ll start chasing you, adding extra tension to the parkour. Will Dying Light 2 support PS4 Pro and Xbox One X? Of course, we expect to do this, and hope to do this. It’s too early to make any specific declarations at this point, because we still have to optimize the game. Of course, we understand the market — you have to support those consoles, because the companies behind them put a lot of emphasis on them. We should be able to do it quite easily, because we have new tech for Dying Light 2. Previous iterations of the game were made using our Chrome Engine, but we realized at the brink of 4K gaming we needed new technology to provide gamers with high fidelity visuals, so we created a new engine, called C-Engine, and it’s ready for whatever happens in gaming. Are you targeting 4K? 60 fps? The most important for us it he fluidity of movement, because it’s a parkour game. You really have to be immersed in how you move through the city, so 60fps is more important to us than 4K. But, we still have a year to optimize, and we have real wizards when it comes to optimization, so perhaps we’ll deliver both 4K and 60fps. Great, thank you for your time! Dying Light 2 shambles onto PC, Xbox One, and PS4 sometime in 2019.